The 4×4 Center’s facility in South Burlington, Vermont, is a 6,000 square foot, state of the art automotive shop that specializes in the service, repair, and restoration of vehicles. Our six lifts and seven bays keep us busy and our customers happy. Within this clean, safe environment, we utilize the finest tools, and the latest technology and equipment available to meet just about all of your 4×4 vehicle’s needs. We pride ourselves on maintaining an extensive collection of authentic Land Rover parts in house so they are immediately on hand. (No delays for shipping if we can help it.) In addition, we have under our roof all the capabilities for fabrication, metal bending, sand blasting, and basic painting. The 4x4 Center owns and operates a remote 4x4 Training Facility where we provide year round drivers training on 3,000+ acres of mountanous terrain. Of the many services we offer our customers really enjoy our Fall Foliage Jeep Rides, On & Off Road Tire Education, Winter Driving Education, and Corporate Team Building. When it comes to driving off-highway preparation and maintenance of your vehicle is very important. 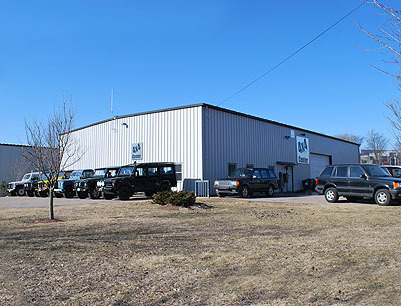 The 4x4 Center not only provides classes to learn more about off-road driving but, our Service Center has the people, skills, and fabrication tools necessary to install vehicle lift kits, over-sized tires, and everything else needed to travel off-road. The 4x4 Center works closely with our community of Off-Road clients and as a nuance to these relationships we have built a Land Rover powered Satellite Communications and Wi-Fi vehicle capable of bringing internet and phone services to remote parts of the world. Tested and developed for the Rubicon Trail, our Satellite's go where ever your business needs take you. Conveniently located just off of 1-89 (Exit 15) in Chittenden County, we offer free shuttle service and free towing services within Chittenden County. Mike Hopwood, owner of The 4x4 Center, grew up driving his parents Land Rover on their farm as a kid. He loved that Land Rover and it wasn't long before his passion turned into a career. What started as an affinity for a Land Rover led him to become a 4x4 Mechanic, and an Off-Road Racer! It was 1993 when Mike Hopwood teamed up with Mark, the owner of Rovers North to establish a Vermont Based Driving School that would encompass both of their passions for off-roading and Land Rovers. In 1998, Mike founded The 4x4 Center which was origonally located Marshall Ave in Williston, VT. It didn't take long to out grow our location and in 2004, The 4x4 Center was moved to it's current location on Ethan Allen Dr in South Burlington, VT. Since then, aditional property has been purchased along the Bolton Valley Access Rd that is now home to all The 4x4 Centers Training Programs. Each year additional programs are added based on the needs of our customers. See what's going on, over at the Training Center!